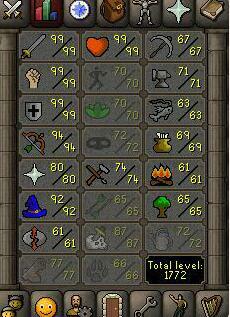 Level102, ATK:70, DEF:70, STR:99, MAG:96, RNG:99, Slayer:57, total lvl:1105, quest points:83. 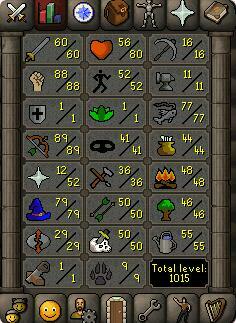 Level88, ATK:60, DEF:69, STR:61, MAG:86, PRA:60, RNG:87, Runecrafting:1, Slayer:20, total lvl:645. Level1, DEF:1 with ATK:40, STR:79, Woodcutting:99, Fishing:99, Firemaking:99, Mining:99, Fletching:93, Agitily:80, Construction:83, theving:70, cooking:70, farming:70. total lvl:1250, quest points:50.